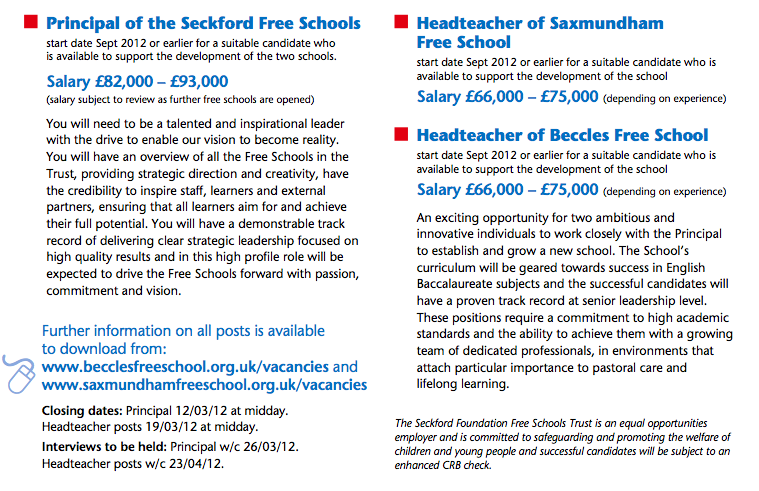 The "Seckford Foundation Free Schools Trust" are advertising for a Principal and two Headteachers for their proposed Beccles and Saxmundham schools. The adverts have appeared in the TES and on the school's websites interestingly whilst the statutory "consultation" is still ongoing. Cambridge Education who are the so-called "independent" organisation conducting the consultation are also the same people who the applications forms need to be returned to for these vacancies. 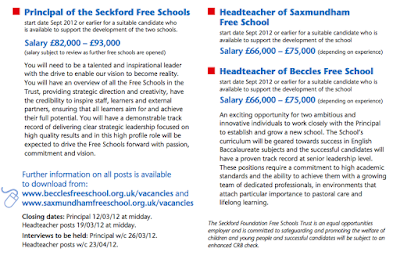 The Principal's post is offered at a salary of between £82 000 and £93 000 although this is likely to increase if there are further schools beyond the initial two and the Heads will get £66 000 to £75 000. A total of between £214 000 and £243 000 a year. In many ways it seems to be a large split site school of the sort the Ixworth Free School group seem so opposed to at Thurston Community College. 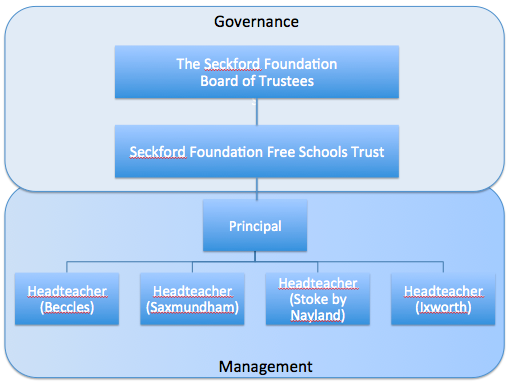 Work closely with the Principal and Heads of other Free Schools to ensure there is a commonality of approach and sharing of educational and human resources. Again members of the Ixworth Free School group have criticised plans for Thurston to share some staff between Beyton and Thurston two sites some 4 miles apart. All of these schools are much further apart. So it is part of the Principal and Headteacher's job to promote Woodbridge School at "every opportunity" whilst working in the free schools. Despite this growth and opportunity there is still only one secondary school in Beccles and the two schools which achieve good academic outcomes are both oversubscribed and up to half an hour away by bus. In summer 2011, the proportion of students gaining five GCSE grades C or above including English and mathematics was in line with the national average. The school’s assessment information predicts that current Year 11 students are on track to do better than this. Data shows that students make good progress during their time in this school. Lesson observations confirm the picture of good progress, although some subjects are more successful than others. In addition I could not find any oversubscribed school's near Beccles other than the brand new Pakefield school in Lowestoft. The nearest school with higher academic results is Bungay High which is currently undersubscribed but does intend to reduce its admissions number. the curriculum is designed to provide a solid foundation for success in the EBac certificate. Firstly there is no such thing as a certificate for the English Baccalaureate. As the DfE make clear it is a performance measure for schools not a qualification. Secondly the abbreviation is "Ebacc" not Ebac".